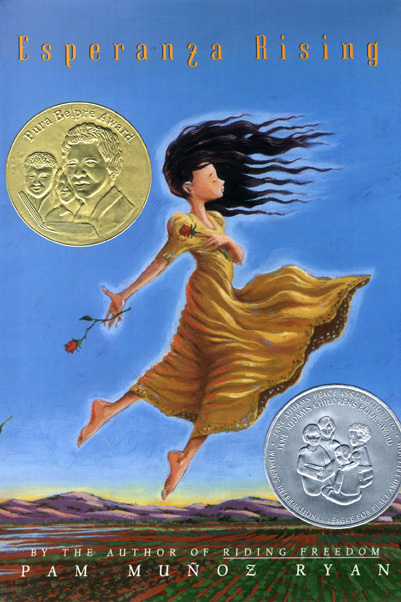 Long before I met Joe Cepeda at the National Latino Children’s Literature Conference in 2012, a post card of the cover illustration of Pam Muñoz Ryan’s Esperanza Rising was tacked to my then-11-year-old daughter’s bedroom wall. Every time I glanced at that soaring figure, my spirits lifted. Surely part of the book’s enormous success can be traced back to Joe’s luminous cover painting of Esperanza floating above the California earth, but that’s hardly the end of his contribution to children’s literature. 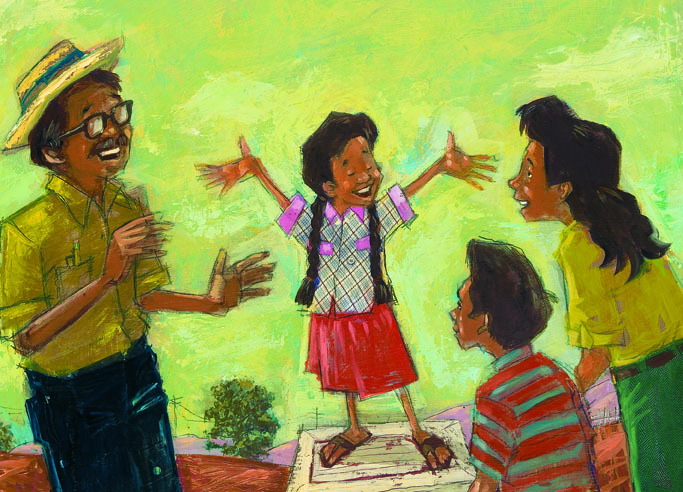 Lila: Welcome to Latin@s in Kid Lit, Joe! Thank you for taking time out of your busy schedule to talk art and books. Let’s start our conversation with Esperanza Rising. How did you come up with the concept? Joe: After seeing the title, it wasn’t too difficult to imagine young Esperanza in the air. My first sketch depicted Esperanza with her hair and dress floating behind her as if she were flying. Almost immediately, however, I changed it and flipped her dress and pretty dark tresses to sweep in front of her. What I realized is that I didn’t want to show Esperanza as if she were navigating in the air on her own. I wanted her to be swept away by the wind. Everyone who has read the book knows that Esperanza’s life changes from one day to the next and I wanted the image to reflect that life-altering event, as well as the hopefulness her story and name literally implies. Lila: What does it mean to you to have your work as the cover of such a powerful story? Joe: A great deal. It’s never a bad thing to have your work associated with a story that has such resonance. In contrast to doing an illustration for a magazine, which has a very short life, a book hangs around longer. A book that continues to reach so many readers, year after year, is wonderful for the life of the image as well. Beyond that, one is always striving to create work that might emotively uplift the reader. It’s a beautiful story and if the cover helps to do just that, it’s very gratifying. Lila: Your list of children’s books includes quite a few with Latino or African American characters. Does being Latino influence your development of minority characters and the worlds they inhabit? 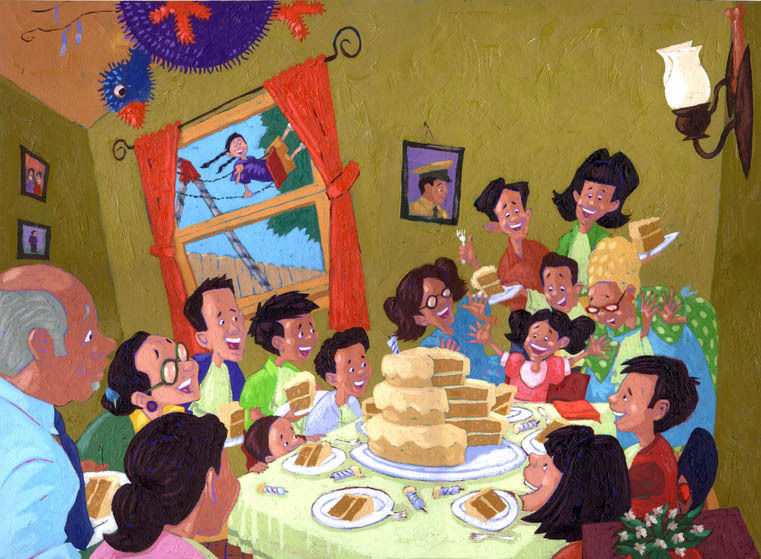 Joe: This is always a bit of a difficult question to answer, perhaps because I think very little about it when I’m illustrating books about people of color. I’d say the books that I see that seem to miss the mark ethnically/culturally seem to overthink it. There are a lot of things I may consider in developing a character before I get to their ethnic depiction. Does she wear glasses? Is she thin? Short? Should he be neat or a bit of a slob? Is he forgetful? Would he wear a hat? Many of the of the character’s inclinations and look are not included in the manuscript. By the time I get to the character’s cultural look, it kind of takes care of itself. I wrote a story, The Swing, that took place in a neighborhood just like the street I grew up on. I’m Chicano, and I could write and illustrate that story about Chicano neighbors from a very immediate and intimate place. East Los Angeles isn’t Spanish Harlem, though, nor is it Little Havana. It seems to me illustrating stories about those Latino communities wouldn’t be all that different than illustrating a story about Inuits in the Arctic, Mongolians living in Yurts, or a story set in the Deep South. I’m respectful of the content and information that presents itself in illustrating stories of people of color, but I don’t live there that long. My preference is not to develop minority characters as much as illuminate the story that’s being told. For me, every step toward “development” is one toward information, accuracy and specificity, which is all fine and good, but it might also be one more step away from grandness and magic… and the informal joy of uncertainty and open-endedness. Lila: What’s on your drawing board right now? Joe: Starting a new bilingual book based on a kid’s song. Writing a story for a picture book. Lunch. And that’s not the end of Joe’s fascinating interview. Please stay tuned for tomorrow’s follow-up post! Joe Cepeda is an award-winning illustrator of children’s books who also works in magazine illustration. 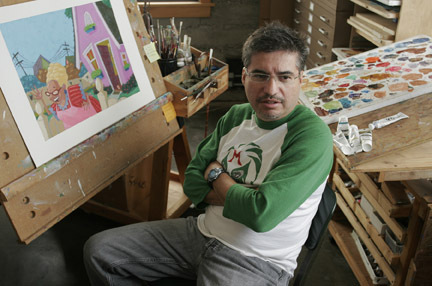 He lives in California and serves as president of the Society of Illustrators of Los Angeles. For more information, visit his website.